← Are schools focusing on healthier food options? In response to a city council vote to ban toys from Happy Meals, an op-ed in the San Francisco Examiner in early November argued that it’s no biggie. The piece came from Karen Wells, vice president of nutrition and menu strategy for McDonald’s USA. She argues that the boxed meals–consisting mostly of processed foods with fairly high fat, sodium, and sugar content–are a treat, not a threat. I’m glad that someone views our fast food nation this way. As I noted in another post, Americans spend just 27 minutes a day preparing food, according to Michael Pollan’s research. He writes that this amounts to half the time we spent in the 1960s. By one count, McDonald’s has sold more than 20 billion of these meals since it first introduced the concept in 1979, averaging more than 640 million per year. Even if families do not receive most of their entrées from a server in a visor, neither is it likely that they pull made-from-scratch meals piping hot from the oven. I suspect this is true even in the Jewish community, where food plays a central role in every holiday and everyday traditions. So what do we do about this? Short of a small-plate coup, or everyone becoming a food blogger in love with cooking and writing about it, how do we make this op-ed claim true? Luckily, there are people out there who regularly put healthy, sustainable meals on their tables. If you are reading this blog, you probably know a few of these people yourself. But, you may wonder, how do they do it? I decided to email a few of these erstwhile cooks who have become adept at wrangling the time, skill, and energy to cook for themselves, their spouses, and their children—all with wholesome ingredients. It turns out that a simple combination of passion, prioritizing, and/or planning do the trick. Leah Koenig, former editor of The Jew and the Carrot, had a basic theory: “I truly believe that we make time for the things that we love,” she responded, “and for me, that wisdom absolutely applies to cooking.” Koenig has both worked from home and gone off to a daytime office job. Regardless of the work situation, she’s always found time to welcome the smell of fresh-baked pizza or pumpkin bread to the Brooklyn apartment she shares with her husband. The same idea was true for Gabe Popkin, who lives with three roommates in a house just outside Washington, D.C. The occupants of Gabe’s house often cook separately but sit down together, or invite a hungry roommate to join a prepared meal. Every week or two, they have a more planned house dinner. Some wannabe at-home chefs do not yet have the passion for laboring in the kitchen. First tip to light a fire, from my research and experience: Turn off the cooking shows, log out of epicurious.com, and start spending time with a real, live cook. Because I cannot invite you all into my one-bedroom apartment, I will offer the next best thing: Logistical tips. Esther James, who lives with her husband in a house on the Jersey shore, offers this wisdom about priorities and pragmatism: “Making a home-cooked lunch in the morning trumps putting on makeup before going to work. I justify it by reminding myself that I can brush my hair in the bathroom at work… but I can’t make lunch there,” she explained. “I generally try to make meals with core ingredients that I can reuse and change throughout the week,” explained Cara Berman. Flexible ingredients I recommend are brown rice, cooked black beans, and steamed or sautéed greens. Matched with a few additional ingredients, each can become a variety of quick meals. The part of the prep that does take time—say, slicing veggies for a salad—Cara considers a chance to catch up with her hubby. For Gabe, buying fresh ingredients and cooking and eating at home blends into his social life. So he doesn’t have to choose between spending time with friends and making food at home—it’s all the same. Leah fits in time during off hours. She’ll take out frozen pizza dough to thaw before she goes to work, or bake in the evening. Ideas like this can lessen anxiety and embolden new cooks. For Jewish home cooks, holidays mean added motivation and lessons in making it work. Maybe a pinch of stress finds its way in there, too. As someone who stayed up until the wee hours folding spanakopita and tossing quinoa salad for a pre-fast Yom Kippur meal this year, I can relate. Natasha Rosenstock, who lives in Potomac, Maryland, finds that the need to plan ahead for her Shomer Shabbat household of herself, her husband, and a toddler packs a nice bonus. “This cooking obligation gives us great leftovers for the rest of the weekend and maybe even Monday–prime time when it is easy to fall back on ordering greasy pizza or Chinese food,” Natasha wrote. All of the above is not to say that these cooks have all the answers. Natasha used to log her most hectic hour of the week right before Shabbat, because she would get home from the office with no time to spare. She would end the night too exhausted to even eat dinner. While Cara feels she and her husband save money by cooking from scratch at home, Gabe estimates that his love for local and sustainable foods keeps his grocery bill relatively high. I do end up grabbing take-out now and then, and often opt to meet a friend at a restaurant instead of at my place over a home-cooked meal. But I also make time for preparing my own food. How could I resist? I can make it the way I like it, and prepare as much or as little of it as I want. The concept of hosting people or prepping a dish for a potluck, which I do most often for Jewish holidays, serves as great motivation. I still believe that home-cooked meals are rare. But I can report that home cooks exist, and that they have plenty of advice for anyone trying to fit in more kitchen time. Now there’s a reason to be happy. Scratch That: How cost-effective is it to make homemade pantry staples? Note: This is a more detailed version of another post that I contributed to The Jew and the Carrot. So for even further further reading, check out that one! 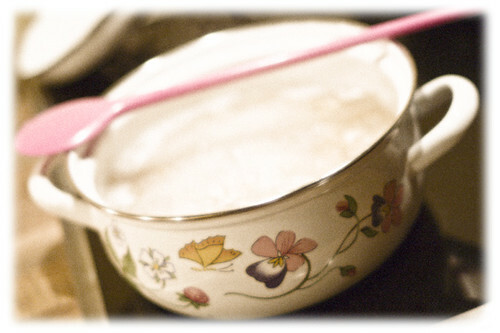 Photo: A cooking pot displays an old-fashioned design to match the erstwhile notion of preparing meals at home. Photo from viZZZual.com, via Creative Commons. This entry was posted in Holidays, Philosophizing and tagged happy meal ban, happy meals, home cooking, JCarrot, Jewish stuff, mcdonalds, san francisco. Bookmark the permalink.